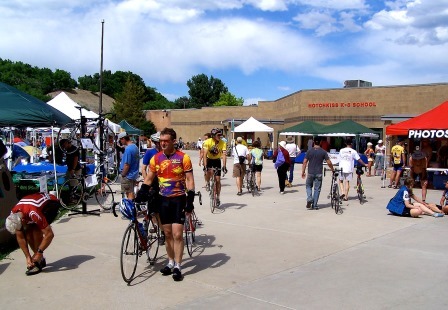 The Hotchkiss community has hosted an overnight tour stop for Ride the Rockies three times – 2009, 2012 and 2015. Headquarters is always the Hotchkiss K-8 school. And Delta County Fairgrounds – two short blocks south of K-8 school – is the locus of evening activities, featuring community meal options, live musical entertainment, the beer garden, and local wines and spirits. Hotchkiss Community Chamber of Commerce coordinates the tour stop, working with local organizations and volunteers to assure that riders have an enjoyable visit and an opportunity to taste the flavor of Hotchkiss and this remarkable valley. Hotchkiss restaurants, retailers, and galleries also welcome riders and guests to enjoy all that downtown Hotchkiss has to offer! We always look forward to Ride the Rockies, other bicycle tours, and individual and small bicyclist groups visiting and enjoying the Hotchkiss area in the future. Scroll down to enjoy photos from 2015. Lodging for riders and their friends and families -- several options. • Tent camping (indoors or out) for lottery winners available at the Tour’s headquarters site located at the Hotchkiss K-8 school. • RV camping area behind the Delta County Fairgrounds, a short walk from downtown Hotchkiss. No hookups. First come, first serve, for up to 200 RVs. • Details and contact info for small motels, B & Bs, and non-traditional lodging options in-and-around Hotchkiss, as well as Paonia and Crawford, is continually being updated. The most current North Fork Valley Chambers' Lodging List PDF is linked here. • The Hotchkiss Residents’ Community “Home Stay” program coordinates supplemental lodging for tour riders, with proceeds benefiting Hotchkiss non-profits. • Traditional hotel/motel lodging partially coordinated through Alpine Cycle Connection. Alpine busses riders to Delta, Paonia, Montrose and Cedaredge. Upon arrival lunch is available at the K-8 school as well as Hotchkiss restaurants. Dinner at the beautiful, shady Fairgrounds Park features food booths run by local non-profits, entertainment by local artists and the beer and local wine garden. For more information about Hotchkiss and the North Fork Valley, please explore this website, and also click on the “North Fork Valley” button below.